Opt for a Winco silicone baking mats rather than parchment paper or grease to cut down on the amount of time cleaning each pan! This reusable flexible alternative is a must-have for any house, café, or bakery that is looking to a solution to everyday pan-lining. At hard-to-beat prices, a silicone baking mat is a product that has no downside! 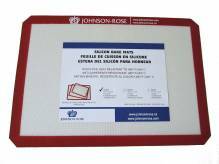 Fitting perfectly into cookie sheets, make your life easier with reusable Teflon pan liners.